Favoritism, shmavoritism – the Valley’s best blogger is PHOENIX magazine contributor Nick R. Martin, whose independently-produced Heat City news blog (heatcity.org) is a true marvel of D-I-Y journalism. Competing against entire newsrooms at The Arizona Republic and other newspapers, Martin took first place in breaking news at the most recent Arizona Press Club Awards for getting the scoop on a series of arrests related to the 2004 bombing of the Scottsdale diversity office. And he essentially performed this service for free, since Heat City is funded by public donations. I was surprised and honored. The issue landed in subscriber mailboxes this week, making perfect timing for my transition back to freelancing and writing on Heat City. Hopefully the work here will continue to live up to the title. You can see a handful of Phoenix‘s other picks on its website. But the whole September issue is worth buying on newsstands when it comes out. It features enough to do in the Phoenix area to keep you entertained for months. 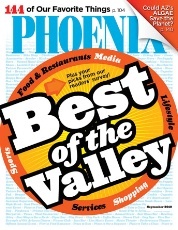 Oh, and for full disclosure: I have contributed a number of stories to Phoenix magazine in the past two years. However, I wasn’t part of the editorial process for this issue. And I am not being paid to write this post.